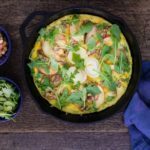 Simple autumnal eats : pear and apple frittata with walnuts, goats cheese and a drizzle of honey. Break the eggs into a bowl and beat with the milk, chopped rocket and salt. Heat the olive oil in a cast iron frying pan, add the egg mixture and allow to cook on medium heat until the frittata starts to set. Then quickly add in the walnuts, cheese and arrange the apple and pear slices in a circular pattern. Place the cast iron frying pan under the grill and cook for a couple of minutes until the frittata is set and slightly golden.